Earn 3499 towards your next purchase with MyRewards. With FLIR Vue you get all the thermal imager you need for sUAS operations without having to pay for functionality you'll never use. Designed for professional use, FLIR Vue Pro is more than a thermal camera, it is a thermal measurement instrument and data recorder that adds tremendous value to your sUAS operations and services. Still with the same industry-leading thermal imaging quality and great value as the best-selling FLIR Vue, the Vue Pro adds full data recording of thermal video and 14-bit still imagery. FLIR Vue Pro also uses FLIR Vue's popular and convenient power-in/video-out connection over a 10-pin mini-USB making integration a snap, and ensuring that you'll have easy access to analog video for downlinking. 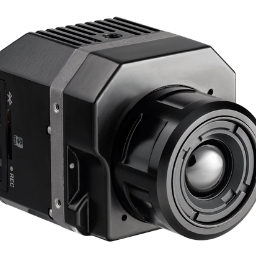 FLIR Vue Pro gives you in-flight control of two camera functions through direct PWM connections, and it's future MAVLink compatibility will make it ready for the easy image stitching required for mapping, survey, and precision agriculture applications. Plus, it's compatible with Pix4Dmapper right out of the box. The convenient mobile app makes pre-flight camera set-up and configuration quick and easy so you won't have to drag a computer out to your flying site just in case you need to change a camera setting. Best of all, with MSRPs starting at only $1,999, FLIR Vue Pro is the only thermal imager your drone operations will ever need, and it's affordable for today's commercial sUAS operations. FLIR Vue Pro gives you more than thermal images, it gives you thermal data for informed decisions. I am using drone-based camera and proprietary processing methods to create information maps that are useful for vegetation and soils mapping purposes. This system currently includes a MicaSense RedEdge Model 3 camera. The subject FLIR camera takes the kind of quality thermal infrared images that I need to have to go with the MicaSense images. So far, the quality of the FLIR images meets my needs for having thermal infrared images that can be co-registered with the MicaSense images to create a unique and very useful set of images for agricultural mapping and monitoring and for other kinds of vegetation mapping and monitoring.